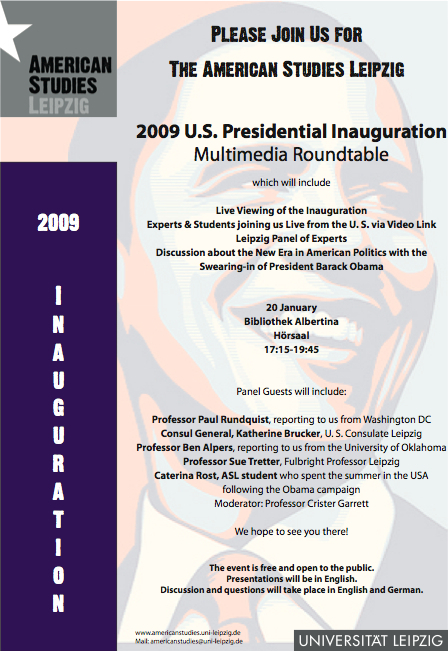 The election08 blog is part of the interactive community of American Studies Leipzig. It seeks to give its readers a European American Studies perspective on the 2008 US presidential election. Our students put the election into a broader context, explaining the issues and their place within the academic debate. Thus, the blog fosters the dialog among the students, faculty, and the general public. Our most regular contributions are by Caterina Rost, an American Studies Leipzig student traveling the United States during the campaign season. Faculty and guest bloggers will join in. Feel free to comment and engage in the debate! Today's inauguration event drew an unexpected crowd as over 200 people showed up for a live viewing of President Obama taking the oath of office, the inauguration speech, and discussions. On the panel, American Studies Leipzig faculty discussed with Consul General Katherine Brucker, and affiliated faculty joining the discussion from Oklahoma and Washington DC. Update: Please see our report page for more information. For those of us who got used to checking out the latest polling data starting around 6pm in the afternoon and making this a central element of their procrastination schedule, the election was a real bummer. Not because of the result, but because the numbers game is over now. The evening after the 2008 presidential election, about 50-60 American Studies Leipzig students gathered for a two-hour discussion with Prof. Paul Rundquist. Rundquist talked about how political interventions such as the 1971 busing decision by the Supreme Court might have helped reduce racism, about the electoral map as it emerged after the election, the question of voter turn-out, and the role Obama's social networking platform and databases might play in the upcoming presidency. Post-Election Roundtable - Please Join Us! On Nov. 4th, American Studies Leipzig students celebrated a warm-up party for the upcoming presidential election. They met over beer, pizza, and snacks to get ready for a long night of watching TV and following the results as they came in. For more pictures, please see the institute's picasa page. Rost says I should post some stuff to the blog. Well, here goes. Yes, I know that you are eager election watchers, but the polls don't close until 1 a.m. German time at the earliest. So, if you need some sleep, here are some tips for things to watch for during the early election returns. In einigen Minuten mach ich mich auf den Weg von Virginia Beach. Übers Wochenende werde ich für das Obama Camp in Süd Virginia unterwegs sein. Was ich da genau mache, weiss ich noch nicht. Heute Abend gibt's einen Workshop in dem uns erklärt wird, was wir machen sollen. "Court Docs: GOP Donor Secretly Funneled $75K To Coleman Family"
"Norm Coleman Sues Al Franken For Defamation"
The October 29 Rasmussen poll has Coleman up by 4 percentage points. Another congressional race to watch is the senate race in Alaska. Incumbent Republican Senator Ted Stevens, who is the longest-serving Republican senator in the U.S. Senate, has a tougher time than expected defending his seat. The Republican has recently been indicted for lying about gifts he received causing the Republican leadership in Washington to call for his resignation. But Ted fights on. The first poll after the indictment shows a clear advantage for Begich. "Unbelievable McCain Vs. Obama Dance-Off"
Here is an entertaining video I just found through the Huffington Post. I dedicate this to all Hip Hop Awareness activists. To check it out, click here. Reviving McCarthyism: Rep. Bachmann, Palin, and the New Republican Strategy? In an interview on MSNBC's Hardball on October 17th, the Republican Representative Michele Bachmann (Minnesota) called on the media to investigate, which members of Congress are anti-American. Bachmann's attempt to revitalize the 1950s McCarthyism triggered uproar among progressives and helped her opponent, Democrat Elwyn Tinklenberg, who raised a million dollars in the days following Bachmann's interview with Chris Matthews. As a consequence of her remarks, the Republican National Committee withdrew funds that it had planned to spend on ads for Bachmann. The Biden/Palin Debate. A Few Quick Thoughts. First of all, I'm relatively relieved that the debate does not seem to have turned out a game changer (the NYT, e.g., asserts that it was not a tipping point). My biggest fear had been that, somehow, the expectations game would work and Palin, going into the debate on her disastrous interviews, would be celebrated as surprisingly strong. Der Blogger und Autor Michael Connery hat beim Parteitag der Republikaner deren Studenten Organisation infiltriert. Vor ein paar Monaten hatte ich Connerys Buch "Youth to Power: How Today's Young Voters Are Building Tomorrow's Progressive Majority" gelesen. Beim Parteitag der Republikaner habe ich Connery dann persönlich kennen gelernt. Unterschiedlicher hätten die beiden Wahlparteitage kaum sein können. Nicht nur die Größe, sondern auch die Atmosphäre war eine ganz andere. Es war offensichtlich, dass die Demokraten in diesem Wahljahr mehr Energie generieren können als die Republikaner. Historisch waren jedoch beide Nominierungsparteitage: Zum ersten Mal wurde ein Afro-Amerikaner zum Präsidentschaftskandidat einer großen Partei gewählt und zum ersten Mal wurde eine Frau zur Vizepräsidentschaftskandidatin der Republikaner gekürt. Nachtrag vom 26. August 2008. Sie sind eine Delegierte für Barack Obama, wie wurden Sie dafür nominiert? Temple: Wir sind insgesamt 22 Delegierte für die Democrats Abroad und wir repräsentieren 7 Millionen Amerikaner, die im Ausland leben. Der regionale Caucus für die Region Europa, Naher Osten und Afrika fand Anfang März in Brüssel statt. Dort wurden sechs Delegierte gewählt. In der internationalen Vorwahl haben 2/3 der Amerikaner für Obama gestimmt, deswegen haben wir unsere Delegation aufgeteilt: Senator Hillary Clinton bekam zwei Delegierte, Senator Barack Obama bekam vier. Ich bin als Obama Delegierte angetreten. Und mehr als 100 Personen haben sich für die vier Plätze zur Wahl gestellt. Letztendlich war ich eine der Glücklichen die ausgewählt wurden, was sicherlich auch daran lag, dass ich durch meine Arbeit im IT-Bereich für die Democrats Abroad in den unterschiedlichen Ländern bekannt war. Can McCain do it? Can he outperform Palin? He certainly has to, if he doesn’t want the news media and the comedians to tear him apart. On Monday, the news broke that Palin's 17-year-old daughter is pregnant. The story caused a intense debate about McCain's judgment and the issue of teen pregnancy in the US. A prominent question has been whether it is even okay to talk about Palin's daughter, since it is a private issue. Sure, it's dicey, but isn't it relevant considering Palin's pro-life stance? On last nights episode of the Daily Show, Jon Stewart questioned former Speaker of the House of Representatives Newt Gingrich about the issue. Today, the Republican National Convention started in St. Paul/Minneapolis. The official program was shortened due to the potentially dangerous storm Gustav. The happenings on the floor in Xcel Center took place for only about 3 hours. President Bush, who was supposed to headline the evening stayed in Washington to deal with Gustav. One delegate told me that that is the best thing that could have happened. Having Bush in St. Paul, he argued, would have only given Obama more ammunition against McCain. McCain's VP pick again underscores how hard the Democrats will have to work over the next 143 days to reunite their party with upset Clinton supporters. At the same time, Obama's acceptance speech, watched by 38 million Americans (! ), showed how many people he can inspire. Still, a large portion of Americans are very skeptical of him and his background. Ted Kennedy (Massaschusetts Senator): "The work begins anew. The hope rises again. And the dream lives on." David Patterson (New York Governor): "In 2007, John McCain voted with the administration 95% of the time. So if he is the answer, the question must be ridiculous." Kathleen Sebelius (Kansas Governor): "There is no place like home. Or a home. Or a home. Or a home." ... check back for more soon. This morning John McCain revealed his pick for Vice President. It was timed as expected: The announcement was made directly after Barack Obama's history making acceptance speech yesterday to reduce the news coverage about the Democrats successful and historic convention and to refocus on the Republicans. I actually first heard about it, when I was at Denver International Airport this morning waiting for my flight to Salt Lake City to depart. Flying through Salt Lake City, Utah, is quite something. The experience certainly met my expectations because on my flight to the Mormon state, a Mormon sat next to me. That fact alone was hilarious: I got the full dose of cultural differences and coming to Utah (even if it's only for a short layover) without meeting a Mormon wouldn't have been authentic I suppose. Today, Barack Obama officially accepted the nomination as the candidate for president of the Democratic party, 45 years after Martin Luther King's internationally known "I have a dream" speech. There is no free wireless internet on the floor and in the press stands in the Pepsi Center… to my great surprise. So I went to the technology center asking about the access at my press seat, only to find out that it would cost me $850, plus $500 because it’d be a late order, to have the internet at my seat for the three days in the Pepsi Center. Seriously?! I decided to safe that money and to use the press filing area that has free wireless instead. The sole delegate for the Democrats Abroad from Germany told me that it was advertised before the convention started. It's just a few hours to go until the Democratic National Convention officially starts. I have been in town since the 21st. I have witnessed a transformation of the city in the last couple of days. Everybody is getting ready for the official opening of the convention Monday night 5 pm ET. The number of police cars and officers has substantially increased. Reports and politicians flocked to town and helicopters started flying regularly over the area. On my flight from Washington DC to Atlanta today, I had a very interesting conversation with the guy, who was sitting next to me. My one-hour conversation with Garry, a computer engineer and registered Republican from Tallahassee/Florida, focused on politics. He was eager to talk politics, asking me about Obama's positions in different policy areas after I told him that I study American Politics. Recently, Barack Obama has been critized for moving to the middle of the political landscape to counter the impression of being liberal given among others by the National Journal. The media and the Republicans immediately jumped on Obama for what they define as flip-flopping. Given the make-up of the U.S. political system (winner-take-all, non-proportional representation, two-party-system, etc. ), however, candidates are forced to appeal to the median voter if they want to win elections.